And now some good news for all users of the Samsung GALAXY Tab 10.1. And for the model GT-P7500, which is the model without the N! Samsung rolled out for you now from the Android 4.0.4 update. It is available immediately. This gives now officially the Samsung GALAXY Tab 10.1, the Android 4.0.4 update ahead of the Samsung GALAXY Tab 10.1N! The Samsung GALAXY Tab 10.1 Android 4.0.4 update has a size of 238.5 MB. The update, lift up your Galaxy Tab on the firmware version P7500XXLQ8 (IMM76D.XWLP6). 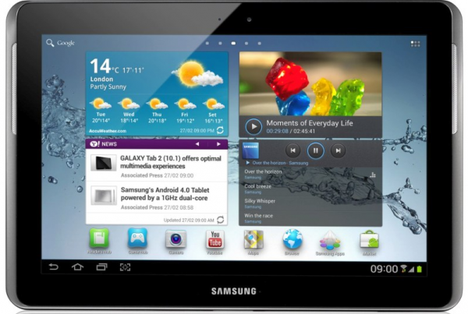 About a possible Changelog the changed features of the Samsung GALAXY Tab 10.1 after the update we would be happy. However, Samsung is not this before. Now, Samsung has indeed but still managed to be GALAXY Tab 10.1 to supply after 1 year with Android 4.0.4. However, I think that this definitely not a user has Android Tablet reckoned on the Android 4.0.4 update. It is a pity, however, that not even at the same time, users of some newer Samsung GALAXY Tab 10.1N the Android 4.0.4 update has been offered! One can now only hope for the users of the Galaxy Tab 10.1N, that they will see you soon on your Android 4.0 Tablet. Anything else would be a disappointment for its users. However, Samsung has also here once again really much time left with the Android 4.0 update. But better late than never!